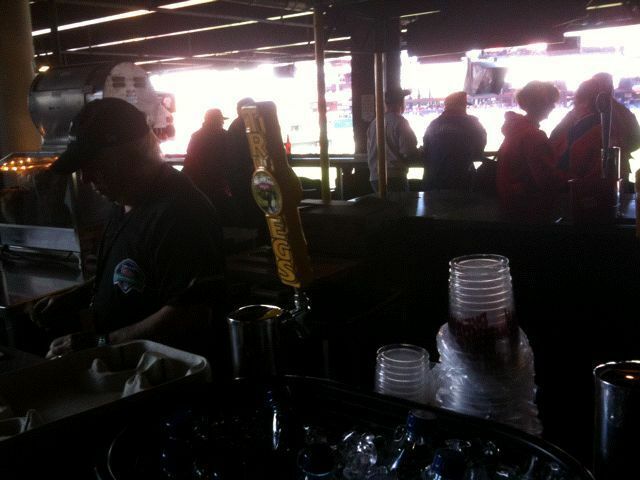 It’s great that Citizens Bank Park has good local craft beer available all throughout the ball park. Beer and baseball enthusiasts are aware that fine local brews like Troegs Dreamweaver, Yards Philly Pale, Flying Fish, Victory and others can be had for a mere $6.75 a cup. OK, we all know that food and drink gouging at the park is routine, and if you like beer, the extra buck or so over the cost of a Bud Light is certainly worth it. My issue is with finding the specific craft beers you want – without missing an inning or more walking around the park scanning for tap handles. I had to go way behind the Alley into the whistling winds to find the great Yards Philly Pale. There are no signs, you have to seek it out and scan the tap handles (one of which is in back pointed the other way) to find your desired brand. So I know it takes nerve to complain when earlier days at the Vet Miller Lite was the best you could get – but how about a little help from the Phillies concession management? A beer brand map might be too much to ask for (though you can find a posted detailed diagram of a Schmitter sandwich) but how about at least a sign that says what’s available at the stand? Well, I guess I don’t mind walking a couple of hundred yards for a couple of Yards at the park — especially when the Phils win!